The great Austrian scientist Nikola Tesla is a household name among today’s scientific community, known for his finding that all matter has vibrational energy, or electrical frequency, and that we are all electrical beings, made up of rapidly vibrating cells. Most of us are vaguely familiar with this concept, but we don’t realize the powerful implications this has for our choices every day—which foods to eat, how much water to drink, what we think about when we’re in the car or the shower, what our risk of disease is, and how we feel at any given moment are all affected by the power of vibration. Vibe explores the foods, natural substances, and lifestyle practices that can raise our vibrations. Robyn Openshaw reveals evidence that shows how drinking green juice, using certain essential oils, and engaging in yoga and meditation raises the frequency of the human brain and other organs. Living in a “high vibe” state can make us resilient to illness, fatigue, burnout, and depression. Readers will learn all about the low vibration emotions (fear, anger, inertia) and the high vibration emotions (love, peace, gratitude) and how to achieve higher vibrations in everyday living. Openshaw explores how the smallest changes in our life—from what we eat to how we think—can radically improve our mood, overall health, and quality of life. Robyn Openshaw, MSW, is a nutrition author and online influencer. She’s written fourteen titles, including the popular The Green Smoothie Diet. A former university professor and clinical psychotherapist, she writes with a credible and authoritative, yet humorous and personal tone that readers enjoy, making scientific subjects accessible and sensitive subjects precise and sincere. To learn more, visit GreenSmoothieGirl.com. Do you want to look radiant, feel fantastic, and live a high vibration life? In this scintillating and wise book, Robyn Openshaw shows you the way. Hint: Eating high vibration foods and cultivating high vibration emotions are two of the keys. Everything has a vibration. Our food, our bodies, our thoughts and emotions. This book is revolutionary and will change the way you see everything. I’m a huge believer in the power of positive energy—and no one radiates more of it than Robyn! In this fascinating and inspiring book, she shares her secrets for changing your own “frequency” so you can become happier, healthier, and more creative than you’ve ever been. Raising your frequency, it turns out, is magically simple. A clear new way to turn negative thoughts around, and make good food choices. The concept of subtle energy permeating all things is as ancient and ubiquitous as language itself. Ancient Vedic texts talked about Samskaras or impressions that are said to imbue all things animate and inanimate. However we wish to think of it, clearly the subconscious information we receive from our environment has a pronounced effect on our mental state and our health. Vibe presents these ideas in a powerful new way that will allow readers to understand them and leverage their power to improve their well being and reverse the effects of chronic stress. A powerful read that changed my vocabulary about health and happiness--with a specific plan that works. Robyn Openshaw will inspire you to take charge of your own destiny so that you can be the person you were meant to be. Vibe will help many people discover how to optimize their energy through a simple plan. Robyn Openshaw is your guide to living a life where you are "tuned in." This book will help you live with purpose--one of the key ingredients to living your best life. 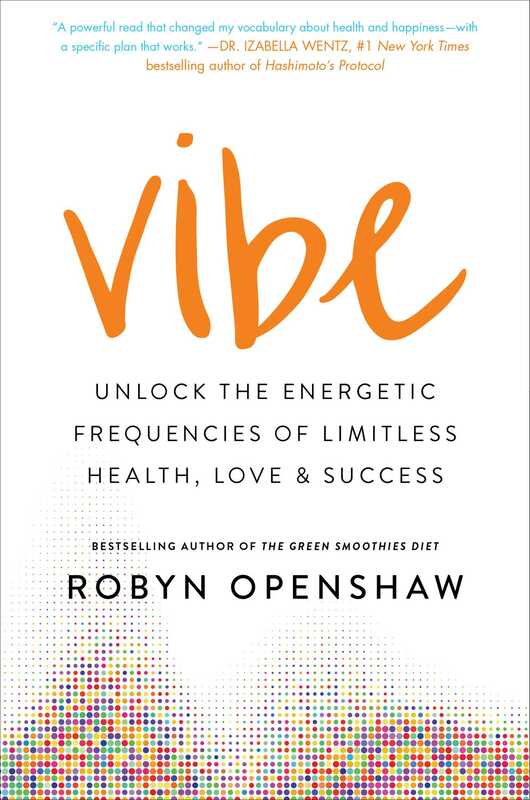 Robyn Openshaw’s new book, Vibe, explores how food and lifestyle practices impact our vibration state, which influences all aspects of our health. This must-read book provides easy-to-apply steps to better mood, vigor, and the best quality of life.